Over the weekend, Greenpeace and the Climate Investigations Center published a set of documents — reported on by multiple media outlets, including the Post – showing apparent ties between longtime climate doubting researcher Wei-Hock (“Willie”) Soon and several energy industry funders. Despite all the attention to who funds him, it is important to note that much of the controversy here is about Soon’s actual scientific views. While Soon has challenged the conclusions of other climate and environmental researchers on subjects ranging from the vulnerability of polar bears to the planet’s climate history, one of his principal arguments has long been that variations in the behavior of the sun, rather than human caused greenhouse gas emissions, are the central factor driving climate change. This “it’s the sun” claim is an extremely popular argument with climate change doubters — according to the website Skeptical Science, it is the second most popular anti-global warming argument of them all, second only to “climate’s changed before.” So is there any truth to it? After all, regardless of who supports his research, if Soon is actually right on the substance then we may be getting all worked up about global warming for nothing. Certainly, the argument that the sun — rather than carbon dioxide pollution — is driving global warming cannot be dismissed out of hand. After all, if there is indeed significantly more solar radiation coming in to the Earth, that would definitely raise the planet’s temperature (and vice-versa). The sun is, after all, where we get most of our energy from. Thus, the argument is at least physically plausible. It isn’t only the IPCC that concludes this. “No satellite measurements have indicated that solar output and variability have contributed in a significant way to the increase in global mean temperature in the past 50 years,” concluded a recent workshop report from the National Academy of Sciences. The report noted that while the 11-year sunspot cycle can lead to changes in total solar irradiance of as much as .1 percent, that only translates into a “few hundredths of a degree centigrade” temperature response on the Earth. 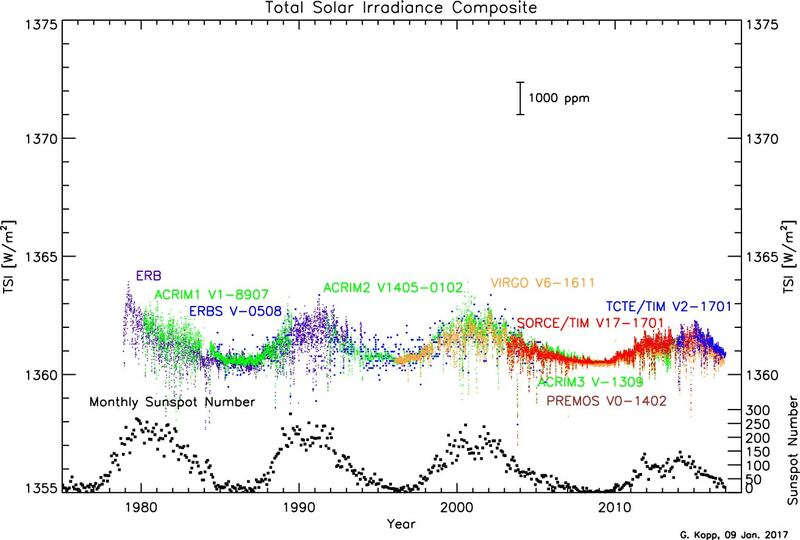 Of particular significance is the fact that solar irradiance has not shown an increasing trend over the past several decades, while global temperatures clearly have. And they have found that, while the sun certainly is not irrelevant, the case for steadily rising carbon dioxide as the principal factor driving the current warming trend just makes a lot more sense. Willie Soon and some other climate change doubters would surely argue back against this finding — but it’s a strong consensus finding, as shown above. The weight of expert opinion isn’t with these doubters — but the burden of proof most definitely is.